There is a cabbage farm just a couple of miles from our house. I am glad it is not closer because at certain times of the year, it is painful to drive down that road – cabbage is a very “aromatic” crop – to put it mildy. Naturally, cabbage was in our CSA basket. I had already made rye bread that day, so I would continue to channel my eastern european-ness and made stuffed cabbage for dinner. Now THIS is comfort food! I remember stuffed cabbage being an all day process for my mother, so I thought “why would I want to put myself through that?” While I was making this dinner for 3, I realized why hers took so long. When she made it, she was typically cooking for a holiday meal of 40 people! No wonder it took all day! Trust me, this cooks for a long time, but the actual work time is well under an hour. Bring a large pot of salted water to a boil. Add the cabbage to the pot and cook just a few minutes until the outer layers of leaves are pliable and can be removed without breaking (I sliced them at their base with a sharp paring knife to remove it). Place the removed leaves in a large bowl of cold water. Continue this process until you have 10 – 12 leaves removed. Save the rest of the cabbage for lining the pot. Pat the leaves dry. For large leaves, slice them in half, removing the center rib. Set aside. Heat the oil in a large skillet over medium heat. Add the the onion and mushrooms and cook, stirring often, until the onions are soft and the mushrooms are well browned. Remove from the skillet and place in a medium bowl. Add the meat to the skillet and cook til browned, breaking up the meat with a wooden spoon. Mix into the onion-mushroom mixture, season with salt and pepper. Let cool. Line the bottom of a heavy pot or dutch oven with the leftover cabbage leaves. Place about 1/4 cup of the filling in the center of a cabbage leaf. Fold the sides of the leaf to trap the filling, the roll up the leaf to form a cylinder. Place in the pot, seam side down. Repeat with the remaining leaves. In a medium bowl, combine the tomato puree, brown sugar, vinegar and water and season with salt and pepper. Stir to combine, taste and adjust the seasoning. Pour over the stuffed cabbage. Cover the pot and bring to a boil. Lower the heat and simmer, covered, until the cabbage is very tender, at least 1 1/2 hours. Serve the stuffed cabbage with the sauce spooned over it. Enjoy! I have to admit that I was shooting in the dark when I made this. I had made a different version before, and it was ok, not great. But I figured, making a tasty combination of rice, beef and cabbage is kind of in my eastern european, Jewish blood. I just needed to figure out how to do a Persian version. 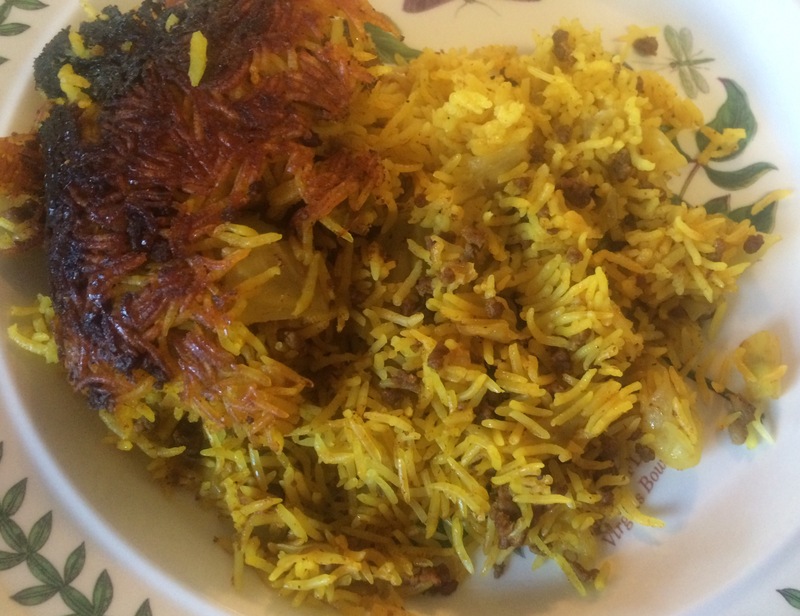 So, I researched some different recipes, and they were all very different from each other, and decided to follow my gut and go to the Persian flavors I know. We ended up with this version…and it is yummy, and comforting, and so beautifully yellow! Gotta love turmeric and saffron! 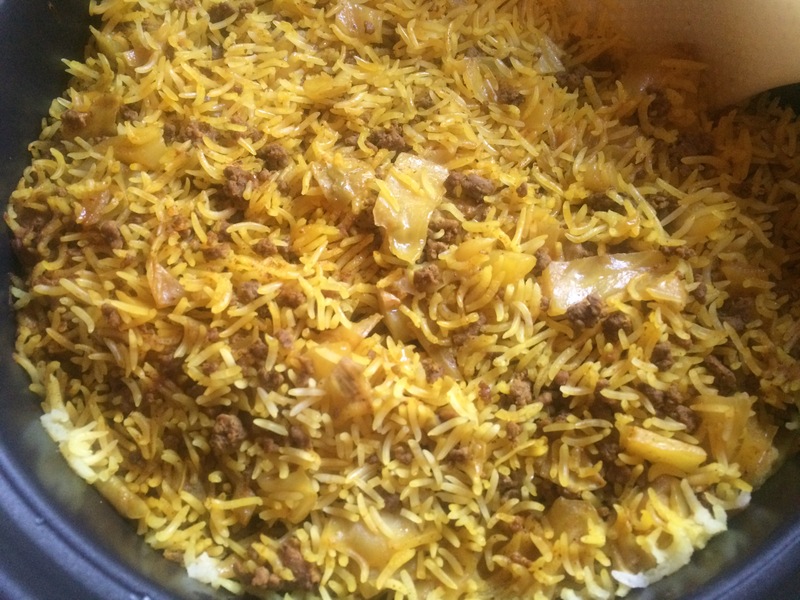 This version uses a Persian rice cooker, but if you don’t have one, not to worry. Instead of putting the rice and meat mixture into the rice cooker, put it in a pot and place a clean dishtowel on top then the lid and cook it over a medium-low flame. The rest of the directions are the same. So much happiness from such humble ingredients. Place the rice in a bowl, rinse with cold water until it runs clear. Then leave the rice to soak in salted water for 2 hours. Heat the oil in a large skillet (one you have a cover for) over medium-high heat. Add the onions and cook until golden brown. 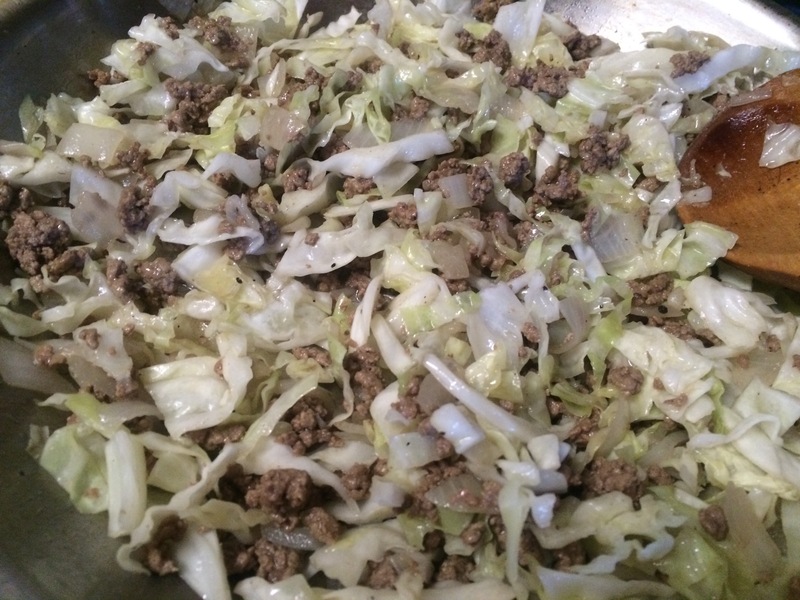 Add the cabbage and ground beef and cook until the beef is browned and the cabbage starts to get tender, breaking up the beef as it cooks, about 5 minutes. Add the salt, pepper, advieh and turmeric. Stir to mix the spices through. Add the tomato paste and cook, stirring, a couple of minutes. Add 1 cup of water and the prepared saffron. Cover the pan and reduce the heat to low. Cook for 10 – 15 minutes. Drain the rice and place it in a rice cooker. Add in the meat and cabbage mixture and mix through thoroughly. Add 2 cups of water, cover and set to cook for 45 minutes. To serve, break up the tah dig that forms at the bottom of the cooker. Enjoy! As I often mention, we eat very little beef in my house, so when we do, it has to be special. This is a recipe I found in the newspaper over 10 years ago and has been a surprise treat every time I have made it. 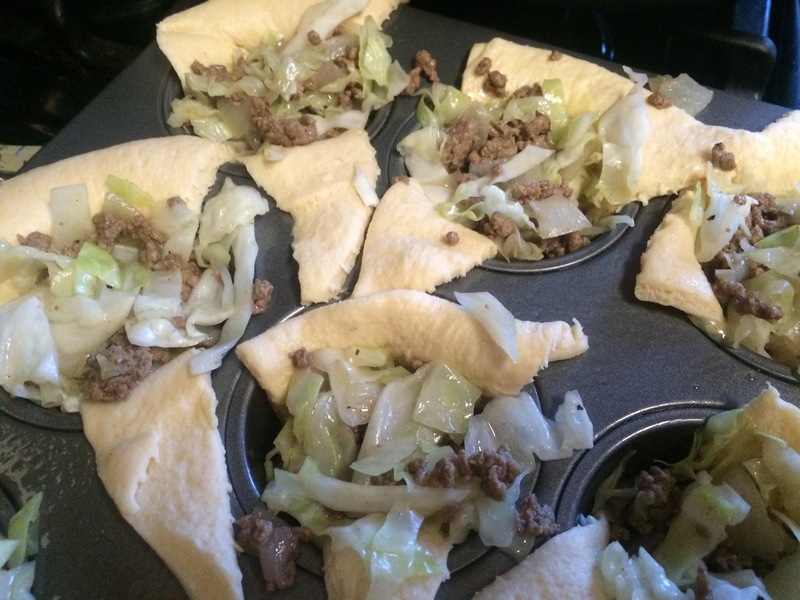 Called “Desperized” Bierocks in the original article, this is simply ground beef, onions and cabbage cooked and then baked in crescent roll dough. So simple, yet when they are served with some good mustard…yum! In a 12″ skillet, heat oil over medium-high heat. 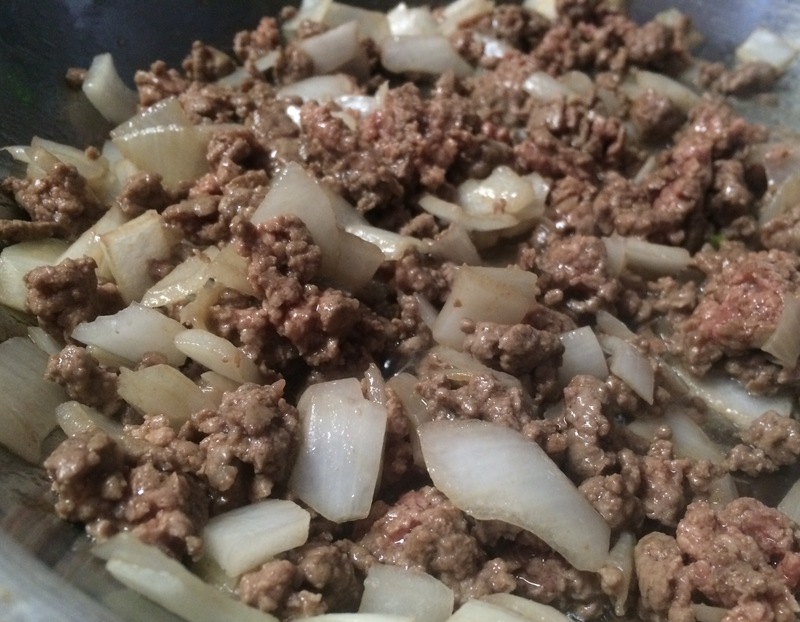 Add the onions and ground beef, cooking and stirring until the beef is browned and crumbled, about 6 minutes. Add the cabbage, salt and pepper. Cook, stirring occasionally, until the cabbage is wilted, about 4 more minutes (if the cabbage is taking a while to wilt, you can cover the skillet for a minute or two). Remove the skillet from the heat. 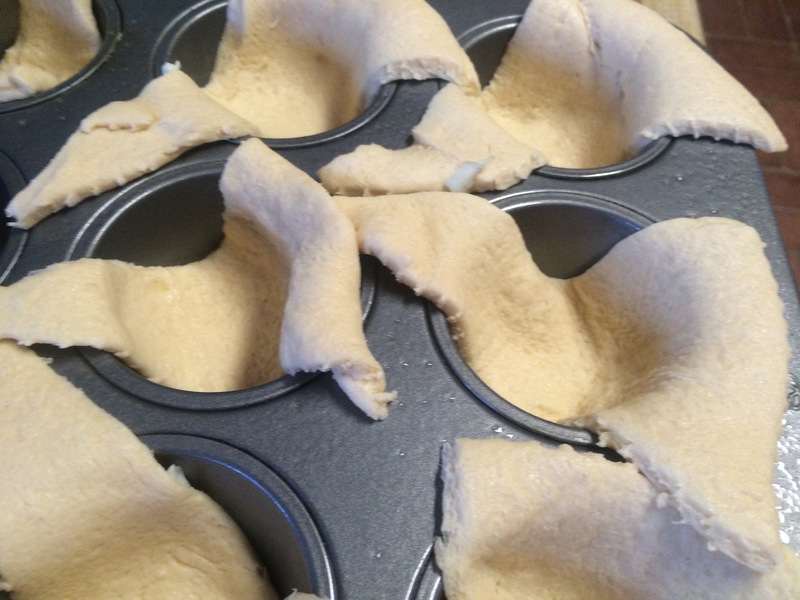 Spray 2 muffin tins with cooking spray (you will only need 16 of the cups). Place the wide side of each dough triangle over the a cup, allowing the wide part to dip into the cup. The dough will not cover the whole cup, that is fine. 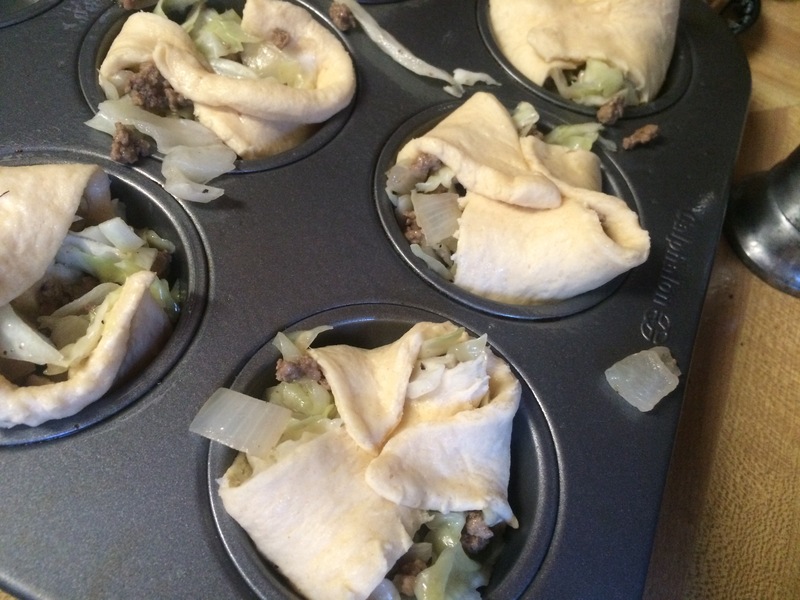 Add 1/4 cup of filling to each cup. Fold the 3 points over the top of the filling. 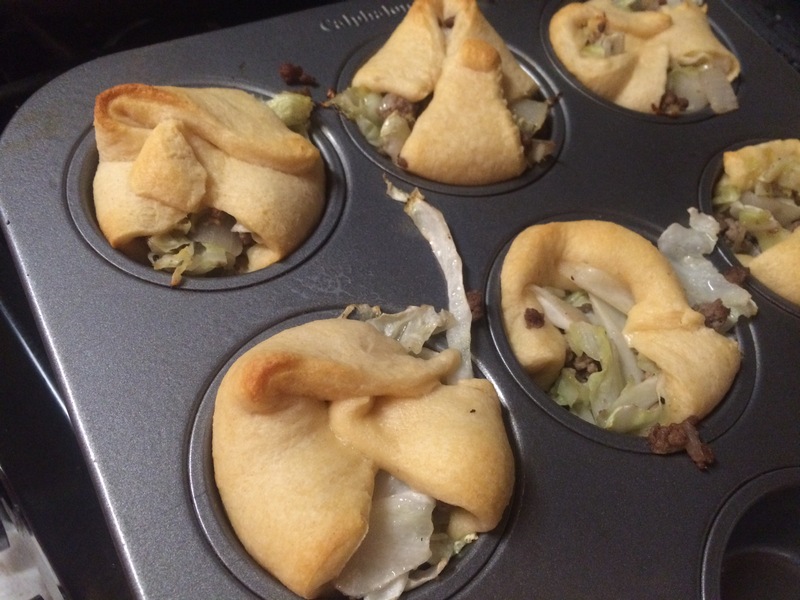 Do not worry about sealing in all the filling. Bake for 8 – 10 minutes, or until the dough is golden brown. Serve immediately with mustard for dipping. Enjoy! Serves 6 – 8. 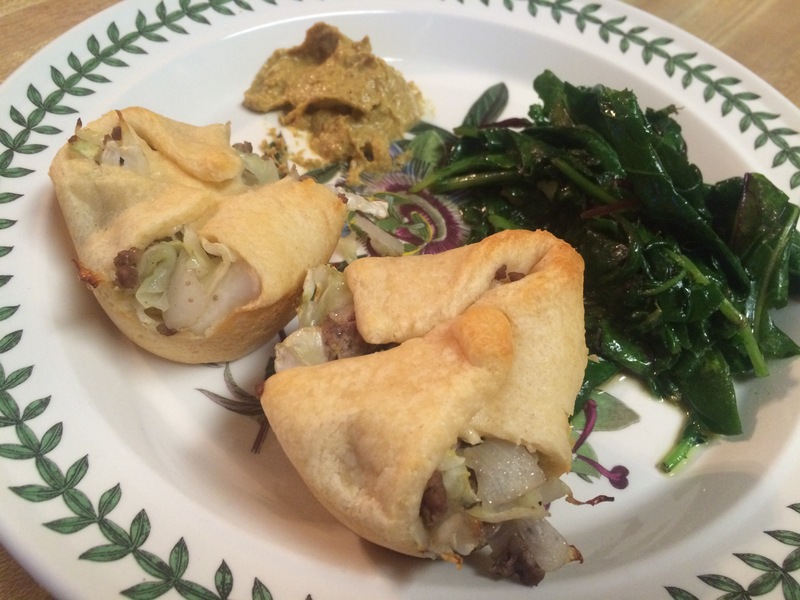 Two of our daughters may need to go gluten free, so I have been trying out some alternative dishes. Tonight it was a kugel based on millet. I love cabbage (as I know I write every time I cook it). This dish did not disappoint. The creaminess of the cottage cheese combined with the richness of the sautéed cabbage belied how healthy a dish it actually was. The only problem, we wanted to go back for seconds and thirds! Preheat the oven to 375 degrees. Oil a 2-quart baking dish. Toss the cabbage with salt to taste and let it sit for 10 minutes. Meanwhile, heat 1 tablespoon of the oil over medium heat in a large, heavy skillet and add the onion. Cook, stirring, until it begins to soften, about 3 minutes, then add a generous pinch of salt and turn the heat to medium-low. Cook, stirring often, until the onion is soft and beginning to color, about 10 minutes. Add the cabbage, turn the heat to medium, and cook, stirring often, until the cabbage is quite tender and fragrant, 10 to 15 minutes. Stir in the dill, taste and adjust salt, and add pepper to taste. Transfer to a large bowl. In a food processor fitted with the steel blade, purée the cottage cheese until smooth. Add the eggs and process until the mixture is smooth. Add salt (I suggest about 1/2 teaspoon) and pepper and mix together. Scrape into the bowl with the cabbage. Add the millet and stir everything together. Scrape into the oiled baking dish. Drizzle the remaining oil over the top and place in the oven. Bake for about 40 minutes, until the sides are nicely browned and the top is beginning to color. Remove from the oven and allow to cool for at least 15 minutes before serving. Serve warm or at room temperature, cut into squares or wedges. Enjoy! I have never met my cousin Bentzi; he lives in Israel and was away when I was there last year. But I have been getting to know him through his art and the cooking he shares with us through our family group on FB. I guess cooking, and enjoying feeding people, is a family trait we share. When he shared the recipe for his pasta and cabbage I was so excited to try it, it looked like the ultimate vegetarian comfort food. In fact, that was exactly what it was called by my vegetarian daughter. I served it with zucchini chips to add some green to this very tan dish. But I have to fess up – my cousin makes his own pasta. Alas, I do not have a pasta machine, so I took the easy way out and searched for noodles I thought most matched what he described. I ended up with an Amish noodle, similar to what they would use for chicken and dumplings. The texture was great. Some day I will make my own pasta, but this will have to do for now. In a very large skillet over medium heat, fry the onions until slightly golden. Add the cabbage and fry until golden. Have patience, this can take some time. I cheated and covered the pot for 5 minutes to speed the process along. Season with salt and pepper. Meanwhile, cook the pasta according to package directions. Drain. Mix with the cabbage and serve hot. Enjoy! As I am busy preparing mentally and physically for Passover, I am taking a break out for “my” two March holidays – St. Patrick’s Day and Persian New Year (Nowrooz). Why are they mine? This year’s celebration included a quick version of corned beef, cabbage and noodles (see recipe below). Meanwhile, in a large covered skillet oven over medium high heat add 1 tablespoon butter and olive oil. When the butter has melted add onion and pinch of salt. Sweat onions for about 2 minutes. Add sliced cabbage to pot and add another pinch of salt. Put lid on pot and cook for 3 minutes. Remove lid and add the beef with pepper, to taste. Mix well to combine. Add noodles and mustard and toss everything together. I had planned to make this for dinner, but forgot to set up the crock pot before I left the house for the afternoon. By the time I realized it, it was too late to make it for dinner that night. So, I put it up to cook when I got home and set it to cook that evening. I prepared it up through shredding the chicken, put the chicken in the sauce and let the flavors mingle even more overnight. This is not a necessary approach, it works just as well as a ‘normal’ slow-cooker dish. One benefit though, was the ability to remove the excess fat from the reduced sauce before reheating, making it just a tad healthier. But oh, it was just as delicious. And, I can’t say enough about how good the apple-cabbage slaw is! Combine ingredients from ketchup to pepper in a large crock pot then whisk to combine. Add chicken halves then cover completely in sauce and cook on low for 4-6 hours, or until chicken is very tender. If the sauce does not fully cover the chicken, every couple of hours, spoon some sauce over the chicken. Remove 2 cups cooking liquid and transfer to a saucepan. Bring to a boil then reduce heat slightly and let bubble and thicken, about 15 minutes. Meanwhile, shred chicken with 2 forks then return to crock pot with remaining liquid and stir to combine. For the Crunchy Apple Slaw: In a large bowl whisk together olive oil, apple cider vinegar, honey, lime juice, salt and pepper. Add cabbage and apples then toss to combine. Place shredded chicken on top of bottom buns then top with reduced sauce (unless you have mixed it all together like I did, and again, I made my sandwich overflowing, you don’t need to). Top with Crunchy Apple Slaw and serve. Enjoy!